Early in harvest season, I promised a blog profile to the wineries that posted the three lowest pHs for harvested grapes. This is the first of those profiles. Grgich Hills is a Napa Valley favorite of ordinary people, but not critics. In the last decade that has come to mean something unexpected: it's a winery that promotes balance. Because it doesn't make blockbuster wines, Grgich Hills doesn't get high ratings from the Wine Advocate and Wine Spectator. 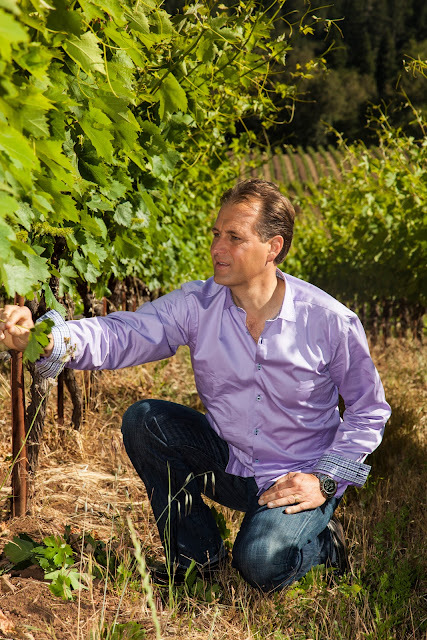 But Ivo Jeramaz, who has taken over winemaking duties from his uncle Mike Grgich, says he has not trouble selling all the wines he makes, and not at low prices either. I have long been a fan of Grgich Hills white wines. The Sauvignon Blanc is one of my favorites from Napa, with great texture and good complexity, yet plenty of freshness. At $30, it's the best value from the winery. Grgich Hills Chardonnay ($42) is one of the best Chards in the Valley; always well-balanced, a good food wine in a regional category where they're rare. It's also one of my wife's favorite Napa Valley wines; she likes the restrained fruit and she likes Mike Grgich. Grgich's American dream-come-true story appeals to her. I used to recommend Miljenko's Old Vines Zinfandel -- it's a nice wine -- but $114 is just too much for Zin. Jeramaz got my attention by harvesting grapes for still wine at under 3 pH. You just don't hear of that in California. When I contacted Jeramaz, I offered him the choice of any story format he wanted. We could talk about Grgich's history, or taste the wines together and discuss them. We could talk about biodynamics. Or we could do something entirely different. Another low-pH winner, Adam Lee, chose to turn the tables and interview me (a decision I suspect he now regrets because he recorded about a 75-minute interview and now has to edit it.) So what did Jeramaz want? Turns out, he actually wanted to talk about acidity. It's a subject he thinks people don't discuss enough in California. I couldn't agree more. So we had a phone conversation yesterday, and this is the edited version. WBG: How's the 2012 vintage coming along? Jeramaz: This is my 27th vintage here at Grgich, and this is the most beautiful one. We have great quantity and quality. I'm not the only one to say this. If you talk to other wine growers, you'll hear that statement. We just had an event the other day at the CIA. The grower from Stony Hill said in 50 years, this is the most beautiful vintage. Normally you don't have the great quality and quantity. You saw that we actually have the lowest pH in our history. But we also have good potential alcohol. Anybody can pick green grapes to get lower pH. But we have good ripeness with 13.5 to 14% potential alcohol. WBG: This isn't the popular style, though. It's very different from what your neighbors are doing. Jeramaz: What people are doing is aging the wine on the vines. They are letting the grapes get so ripe that the wine they make tastes soft, it even tastes oxidized. They are very successful. They are fetching $300 a bottle and getting 95 points from Spectator. But I believe it's a dying breed and most winemakers will have to switch to another style. You can get softer tannins by picking so late and you can drink the wine sooner. But it's boring. It's one-note, it has no personality. If the wine is a bit more tannic because some years it's cold, so be it. We're not fighting against personality. We're encouraging personality. WBG: But you're not being rewarded for it. Jeramaz: I have been hoping there would be some change with (new Wine Advocate California critic Antonio) Galloni. For the past 30 years, Robert Parker never liked our style of wine. I was hoping (Galloni) would finally appreciate the European style of winemaking. Then he used the same descriptions as Parker: lean, acidic wines. Maybe he's not allowed to break out yet. From the main publications, Spectator and Parker, we don't get high scores. Once you get put in that category, you are between 85 and 90 points, you must stay there. We have made our reputation with clients who like our style. We sell everything we make. We make good money year after year, and we do it with 100% estate wines. Our pleasure is in doing something beautifully. WBG: How important is it to control your own estate grapes? Jeramaz: This is crucial. When you're buying grapes from Beckstoffer, it's easy to overripen everything. I was not happy having to buy grapes. Over the years, if Mike (Grgich) had bought grapes for $700 and somebody else would pay $1000, Mike still wanted to pay $700. So over the years we were getting very average grapes. In 2003 we became all-estate. It's like having kids. I have six kids so I know all about it. You just take one look and you know what's going on. You can understand when to pick. You can look at numbers, but it's better to work with experience that you have every year. WBG: Are you picking earlier than you used to? Jeramaz: I remember 15 years ago picking Cabernet at 22 1/2 brix. It was too early. Fifteen years ago I was tasting Sauvignon Blanc. I was trying to find what were the best parameters for picking Sauvignon Blanc. I found grapes that were the most beautiful, that had the best aromatics. So I picked at 26 brix. The wine had 15% alcohol. It was the worst Sauvignon Blanc I ever made in my life. There was no fruit, it was only the taste of burning alcohol. So when I hear people say they pick on taste, they are making a mistake. You cannot rely on tasting fruit. This is something you learn every year. When the grapes taste good, they taste good because they have good sugar. When you pick Sauvignon Blanc at 22 1/2 brix, it tastes too tart. But when you taste the wine later, it's delicious, it's very aromatic. This is what you learn. Maybe one year we'll pick some at 21 1/2 and some at 22 and some at 22 1/2. You pick with different ripenesses from the same block. Then we'll make the wine and see what happens. Nobody wants to pick with the raw numbers. But the numbers are sometimes more important than tasting. You have to do it with trial and error. It's very complex but that's what makes our wine so interesting every year. WBG: Do you ever feel pressured to pick by rising pH (of the grapes)? Jeramaz: In the old days we had to pick because the acid was dropping. But now that we're growing biodynamically, the grapes maintain their acidity. I used to be afraid of higher acidity. I used to be afraid of 8 1/2 grams. Not anymore. This year our Sauvignon Blanc will be over 9 grams total acidity. 13 1/2% alcohol. If you add tartaric acid to get to that level, it would be undrinkable. But if you get natural acidity, it's part of the total package. WBG: I can't wait to taste that 2012 Grgich Hills Fume Blanc. And support the site by buying a t-shirt. The "pick on taste vs not" debate is interesting to me. Would be great to hear (read) winemakers on both sides debate each other (hint hint) to let the information found in creases of the differences shake out. A lot of what was discussed depends on the region in which you make wine. If you have a short, sharp, brutal summer like we do in the Okanagan and in Eastern Washington, you are going to get very different fruit to that which is grown in a more moderate, but much longer season such as those found in Napa. We find that our tastiest and most intensely flavoured white wines come from 24.5 brix. At 22.5-23.5 brix, flavours have generally not been fully accumulated. Furthermore, only certain grapes respond to those climatic conditions. And so, experimentation is key. Yes, we need to completely decouple Brix from "maturity." Hey Unknown (and why not post under your own name, what is there to hide? ): I agree that in the Okanagan, with its short season, and rapid brix accumulation, letting them hang to the 24.5 brix level probably is called for, even though this leads to relatively high alcohol levels. In Napa or Sonoma, 22.5 to 23.5 would likely provide the flavors without the distraction of high alcohol.